I’ve been keeping this one on my radar for awhile and have just been waiting for a release date before I bothered posting anything about it. Well the wait is over or rather the wait for the release date is over. Lovely Molly will be released May 18th of this year so you just have to wait until then to see it. 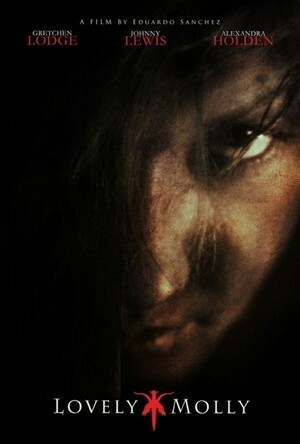 It looks part supernatural part psychological horror and I personally anxious to see what the guys who brought us the Blair Witch Project can do considering they haven’t done anything of note since. Newlyweds Molly (Gretchen Lodge) and Tim (Johnny Lewis) move into her childhood home after the death of her father. Soon after, strange things begin happening. Door alarms are triggered in the middle of the night and footsteps are heard throughout the house. Tim, a truck driver, believes the sounds must be result of wind, or the neighbourhood children playing pranks, so when he leaves on his next job, he’s not concerned about leaving Molly alone. With Tim gone, Molly is left alone with reminders of her nightmarish childhood. A malevolent force tirelessly seeks to overwhelm her and she begins a slow descent into depravity, returning to her drug addiction that she’d had under control before marrying. When Tim returns, he finds Molly in a terrible state and he realizes he has to fight to save them both from the evil that is trying to pull her into darkness. 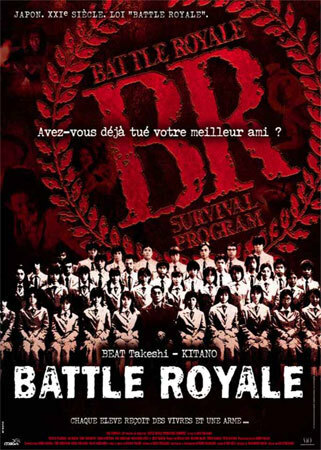 Released in 2000 over in Japan and based off the 1999 Novel by Koshun Takami battle Royale would come out at a time when (at least in the West) children killing eachother in a massive death-match with only one survivor was incredibly taboo. Most of us remember that in April of 1999 the notorious Columbine shootings occurred. The media tried desperately to make sense out of a senseless act. They attacked music, parenting, modern society and of course movies. They took aim (pardon the pun) at everything from Marilyn Manson to The Matrix for being the source of the bloodshed. Talk about bad timing. I say bad timing because who could have predicted that in less than a year a movie about a group of junior high students forced to kill eachother off would be made on the other side of the world. As such this film never received a region one release and it forced us to find it bootlegged or on region free DVDs. So what’s changed? Have we become numb to this sort of thing? School shootings happen more frequently than pre columbine but it has been over 10 years. Surely fan demand (and the chance for profit) would circumvent any moral issues you’d have. Let’s not forget the very fact that a movie like the Hunger Games which is a complete rip-off of Battle Royale (the book came out almost 9 years after the fact) is not only getting the big screen treatment but it’s being sold as “the next big thing” I don’t blame Hollywood for scrambling. They ran out of Harry Potter and soon going to run out of Twilight. Next time they should wise up and just make every chapter of these books its own movie. That way it could last for decades. The saddest thing is that if you sit back and watch Battle Royale, you’d realize it’s more of a black comedy than anything else. It’s satire. Sure it deals with some uncomfortable subjects and does have some touching moments between some of the short lived characters but it’s totally irreverent and can seem self aware at times. Certain scenes are really tragic while others are so over the top you can’t help but laugh. Of course many of those moments come from the benefit of it being so uniquely Japanese. That being said it does have chilling moments where when pushed comes to shove anybody can be a killer. It’s really no wonder people were so hesitant to translate it over here. But now they have. The real question is, is it worth your money? Well my bias opinion is yes, I’ve had my awkwardly translated Korean boxset with un-translated extra features long enough and am eager to sit back and watch a quality version of the movie. You can get the movie and its sequel (yup there’s two) in a sweet set with a tonne of extras. The next question is will I go and see Hunger Games? My answer is, they already made that movie twelve years ago and it was awesome. Sometimes when I grab something off the DVD shelf I never know what I’m going get. 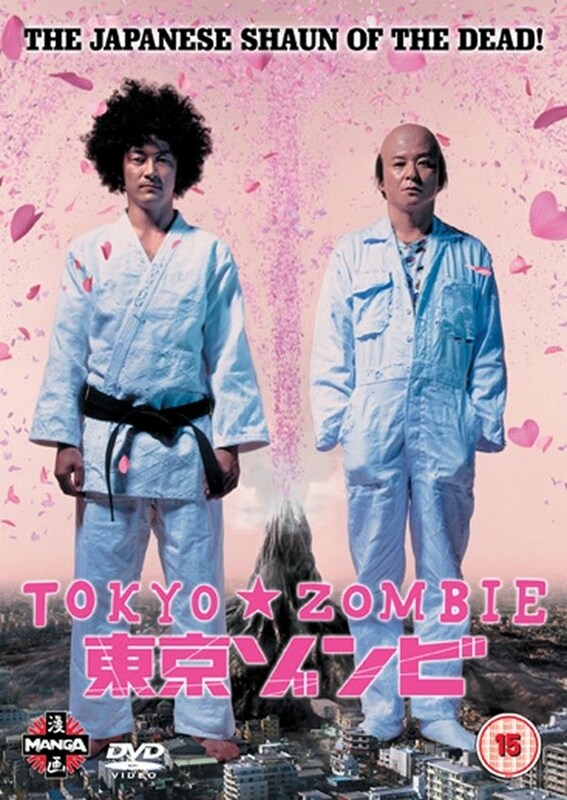 I had a feeling about Tokyo Zombie: A movie with Jiu-Jitsu, zombies and comedy? Sold! While I’m the first to admit that with all of the over-saturation of the zombie genre in the last few years I tend to roll my eyes at every new title announced I do find it fun that some things get region one releases where they might never have if zombies weren’t hot right now. Tokyo Zombie was released in 2005 in Japan, and was given a region one DVD release in 2009. It’s based off the popular 1999 Manga written by Yusaku Hanakuma. The films directing duties were handed to Sakichi Sato and it stars Tadanobu Asano and Show Aikawa. The year is unknown, I guess modern times but in this version of Japan there is a massive garbage dump at the epicentre of Tokyo. It’s full of toxic waste, garbage and the discarded bodies of the dead. The people call it “Black Fuji” because of the black ash that surrounds the mountain. Death and murder are treated pretty differently. If you kill somebody you just dump the body and forget about it. It makes for a few hilarious situations. The main characters are Fukio and Mitsuo, (Asano and Aikawa respectively) they are you typical idiot and straight man buddy picture duo. The fun thing is how the pair are obsessed with becoming Jiu-Jitsu champions. They train all day instead of focusing on their jobs at a fire extinguisher factory (where they seem to be the only ones who work there). Their boss shows up and after a brief argument they accidentally kill him. So off to Black Fuji they go to get rid of his body. This is about where the zombies start popping up and then it’s their fight for survival as they make their way to Russia where apparently the manliest men live and they can perfect their fighting styles. The films take an interesting turn about midway through and does a time skip. I’m certain that’s just how the Manga ended up but as a movie it’s pretty weird. A lot of zombie movies take place either at the initial outbreak or well after the fact in sort of a post apocalyptic scenario where humans are barely surviving. A good example of the two extremes would be if Night of the Living Dead and then Land of The Dead were one movie. When it gets into this portion the whole buddy comedy thing is over and now it’s just Fujio fighting in arena style matches against the undead. There is a hilarious twist towards the end of the movie though that I thought was fantastic. I usually don’t like it when movies switch gears like this so dramatically but in this case I felt it worked. The jokes are mostly physical comedy which is good. A lot of times when you’re watching a movie from Japan the jokes can be lost in translation but I found myself laughing out loud at more than a few scenes. I wouldn’t say it’s very gory so people looking for that type thing will be disappointed. It’s also plagued by some pretty bad CGI but I think in this case they knew it looked ridiculous and in a lot of ways it serves to enhance the comedy. Check it out!